Last week Mobilegov held its 4th Annual Federal Mobile Computing Summit at the Ronald Reagan and International Trade Center with over 75 vendors, including Apple, Unisys, Appian, Sprint, BlackBerry, Good Technologies and Samsung. The all-day Summit examined the post-Digital Government Strategy landscape and looked at how agencies have actually implemented mobility within their organizations. It also examined the next generation of mobile technology, user experience case studies, and what lies ahead for the Digital Government Strategy plan, launched in May 2012. Dr. Rick Holgate, Assistant Director for Science & Technology and Chief Information Officer (CIO) at the U.S. Department of Bureau of Alcohol, Tobacco, Firearms and Explosives (ATF), keynoted the packed event. Read more about his visionary keynote address on WashingtonExec. The summit’s keynote panel included Kevin Cox of the U.S. Department of Justice (DOJ), Robert Palmer of the U.S. Department of Homeland Security (DHS), and Mark Norton of the U.S. Department of Defense (DOD). Dr. Holgate served as panel moderator. Palmer, Director of Information Assurance at DHS, almer. move that data.ture baseline is still needs updates at DHSics has it’secure mobile devices on the infrastruce, anwas able to give the packed room a synopsis on what his department is working towards, and where he sees growth for the agency in the next couple years. According to Palmer, the Digital Government Strategy proved that collaboration is key when implementing secure mobile devices on the infrastructure, and he urged his colleagues to continue to “bounce ideas off of each other”. “We are still working through how we use mobility to change the way we deliver IT services and data. One thing I want to highlight is that the Digital Government Strategy taught all of us that it can be done. It is the model going forward,” said Palmer. “The collaboration that took place during this year-long effort –that really condensed itself into six months– the collaboration that took place was beyond anything that I have ever seen across the DOD and DHS,” Palmer added. 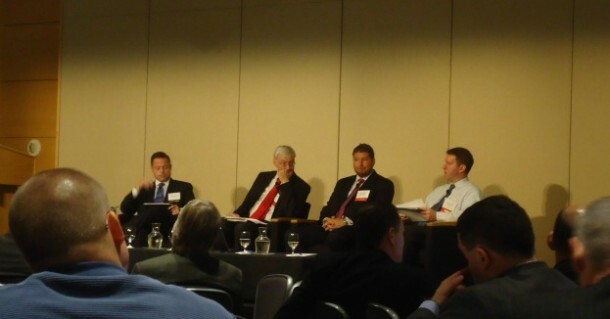 Next generation needs and data security for DHS were also key points made by Palmer during the hour-long discussion. “We are going to spend a good bit of effort on agile development, on continuous integration, and ask how we look at application lifecycle management,” Palmer told the audience. Moving beyond mobile pilot programs is only possible if data security meets privacy standards and and releasing government data is achieved, noted Palmer. “Right now we trust containers, that is just kind of what we do,” said Palmer. “We eventually want to get to the point where we trust the data-we can tag it, label it, monitor it as it moves throughout the infrastructure, as that trust model expands, we can hopefully continue to develop the technology,” suggested Palmer. However, like all next generation technology capabilities, a secure infrastructure baseline is still needed at DHS. “A big one is authentication. We need to know who is assessing the data…If we are going to get to the point where we are utilizing the collaborative technologies that are out there we need the infrastructure to be efficient and be able to move that data,” said Palmer. “In closing, the digital government strategy really set that model going forward. I for one, am very appreciative of the willingness of all the parties for coming forward to achieve the success that we have,” said Palmer. Find photos from the event on the WashingtonExec facebook page.